Worldly-wise Huckleberry Finn is a scapegrace and a troublemaker, up to the same old hijinks as his eponymous predecessor. 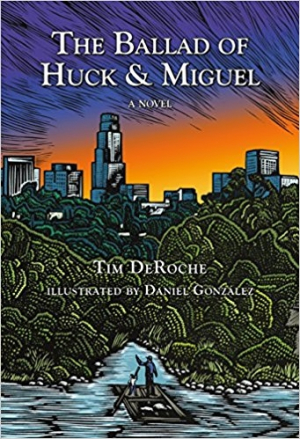 The Ballad of Huck and Miguel by Tim DeRoche pulls the drama of Huckleberry Finn into this century for a beautiful, heartbreaking story of survival, escape, and finding home. With his abusive, alcoholic Pap waiting for him at home, Huck makes sure he’s anywhere but there as often as circumstances allow. When Pap drags him from Missouri to Los Angeles, Huck lights out on his own. His journey culminates in riding down the Los Angeles River with Miguel, trying to outrun his father and the law. Worldly-wise Huckleberry Finn is a scapegrace and a troublemaker, up to the same old hijinks as his eponymous predecessor. But in this novel, it quickly becomes clear that this version of Huck isn’t driven by malice and cussedness, but instead by a big heart and an agile mind. Without many outlets for his thoughts and feelings, Huck records his story. It is full of vernacular, malapropisms, and portmanteaus, and is very much his own. While Huck’s narrator’s perspective is limited, its limits feel like a natural outgrowth of his childish self-centeredness and white privilege, rather than of authorial oversight. Huck’s limitations serve to sharply emphasize just how complex his world truly is, even as he is left, unschooled and barely literate, to draw his own conclusions about it. Among the many people Huck encounters, none are as formative as Miguel, the illegal “Mexigrant” and employee of Ms. Douglas and Miss Watson. Miguel’s stability and calm open Huck’s heart to the possibility of attachment and trust. Miguel’s generosity to this feral child comes from a deep, broad humanity. Miguel’s space might literally be the barn where he lives and cares for Ms. Douglas and Miss Watson’s horses, but the space he generates from within is one where panicked horses and children alike can finally relax their fight-or-flight instincts. While Miguel could easily become a token in Huck’s story, DeRoche does an excellent job of limning Miguel’s own unique driving forces—his separation from his family, his immigration status, and his keenly felt sense of responsibility for Huck—throughout their encounters. If Huck is poorly equipped to see beyond himself, it’s often because he has spent his whole life shouldering the burden of his own survival in a hostile world. This fact makes Huck’s forays into friendship all the more poignant and miraculous. It is clear in DeRoche’s vision of the story that the adults who finally connect with Huck have felt that sharp ache too. In The Ballad of Huck and Miguel, Huck’s story is still one of struggle, though his experiences set him apart while also helping him find his own tribe.